(or stage) a large, soundproof area/room in a studio used in film production, where elaborate sets may be constructed, to allow film-makers greater control over climate, lighting, and sound, security, and spectators. Example: The "You Were Meant For Me" scene deliberately shot on an empty sound stage, in Singin' in Rain (1951). spaghetti western a western, low-budget B-movie filmed in Italy (or Spain) during the 60s, usually characterized by low production values, sparse dialogue. Examples: Sergio Leone's westerns, starring Clint Eastwood as an amoral drifter - the poncho-clad gunslinger Blondie. (or F/X, SFX, SPFX, or EFX) a broad, wide-ranging term used by the film industry meaning to create fantastic visual and audio illusions that cannot be accomplished by normal means, such as travel into space. Many visual (photographic) or mechanical (physical) filmic techniques or processes are used to produce special illusionary effects, such as optical and digital effects, CGI, in-camera effects, the use of miniatures/models, mattes, rear-camera projections, stop-motion animation, bluescreens, full-scale mockups, pyrotechnics (squibs (miniature explosions, i.e. a gunshot)), stunt men, animatronics (electronic puppets), rain/snow/wind machines, etc. ; F/X are coordinated by the visual effects and the special effects supervisors; known negatively as trick photography; see also visual effects - a sub-category of special effects. See this site's Milestones in Special/Visual Effects in Film History. Examples include: phone conversations between Rock Hudson and Doris Day in Pillow Talk (1959) (shown above); Woodstock (1970), The Thomas Crown Affair (1968), Napoleon (1927), and The Grifters (1990) (shown above); also in scenes between an actor and a wild animal on different sides of the frame, used in Bringing Up Baby (1938), Forbidden Planet (1956), and Krull (1983). 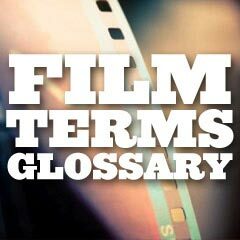 Examples: "Darth Vader is Luke's father," "Rosebud" is the name of the sled in Citizen Kane (1941), Norman's mother is alive in Norman Bates's psychotic imagination, or a film's plot twists (e.g., Shyamalan's films), etc. spoof usually a comedic film that pays tribute to an earlier film in a humorous way. stand-in a substitute person who is physically similar (in size and appearance) to an actor and who takes the actor's place during often lengthy preparation of a scene (the taking of light meter readings, camera setup, light adjustment, etc.) but not during filming. Not to be confused with a stunt double or a body double. still refers to a single, static image, either (1) a frame still (possibly enlarged) from a finished film, (2) a production still taken from an unfinished film, or (3) a publicity shot (of an actor or scene); aka photogram. stinger a surprising, last-minute bit of dialogue (or footage) that appears after the end (or closing) credits Example: title character Ferris (Matthew Broderick) breaks the fourth wall and tells the audience: "You're still here? It's over! Go home. Go!" in Ferris Bueller's Day Off (1986); or the end of The Muppet Movie (1979) when Animal yells at the audience: "Go home! Go home! Bye-Bye." stock character a minor character whose actions are completely predictable, stereotypical, or standard for his/her job or profession; similarly, a stock situation is a basic, recognizable plot situation (e.g., a lover hiding in the closet, twins mistaken for each other, etc.). Examples: the wily servant, the braggart soldier, the innocent virgin, a drunken husband, etc. Examples of two storyboard sketches (and the actual scene) from Steven Spielberg's Jaws (1975). straight man an actor/actress who serves as a stooge for a comedian (or funnyman), usually by adopting a serious stance or reaction to the comic partner; the straight man often feeds lines to the other irreverent comedian - who replies with witty comments; aka second banana or foil Examples: Margaret Dumont in numerous Marx Brothers films (pictured here in the opening scene with Groucho in A Night at the Opera (1935)); also Bud Abbott to Lou Costello. studio(s) (1) the for-profit companies that specialize in developing, financing and distributing most American commercial films; (2) also refers to the actual site for a film production, with physical sets, stages, offices, backlots (located on the outdoor grounds of a film studio and used for filming exteriors), etc; see also majors and independents, and mogul. Example: An archival view of the front entrance to Paramount Pictures film studio. studio system refers to the all-powerful control the monopolistic film studios had over all aspects of assembly-line filmmaking and film production from the 1920s until the late 1950s, when chiefs - moguls (Mayer, Selznick and Zukor) ruled; tactics included the ownership of property, control of publicity and marketing, and iron-clad contracts with star-actors, directors, composers, cameramen, costume designers, writers, and producers. subplot a secondary, subordinate, or auxiliary plotline, often complementary but independent from the main plot (the A story), and often involving supporting characters; not the same as multiple plotlines; aka the B story or C story Example: the additional plotline of 'video peeping tom' Ricky Fitts (Wes Bentley), the teenage son of Col. Fitts (Chris Cooper) - the next-door, repressed, Nazi-worshipping neighbor, and how Lester Burnham (Kevin Spacey) is mistaken for being gay in American Beauty (1999). subtext the deeper and usually unexpressed "real" meanings of a character's spoken lines or actions - if the viewer can 'read between the lines'. Example: Subtitle in Close Encounters of the Third Kind (1977). Example: in Hitchcock's Vertigo (1958) during Scottie's nightmare sequence, his face is superimposed over a drawing, or in Citizen Kane (1941) the superimposition and exposure of two images: reviews in the SF Newspaper and Susan Alexander's performance. surreal (surrealism) a term applied to a film, signifying a distorted or fantastic dream state, a nightmarish or hallucinogenic world, or a subconscious thought or death experience; often expressed by a random, non-sequential juxtaposition of images that go beyond realism Examples: the eerie Salvador Dali dream sequence in Hitchcock's Spellbound (1945), and David Lynch's Eraserhead (1977) (pictured). swashbuckler usually refers to adventure films with an heroic, athletic, sword-wielding character Example: Errol Flynn's swashbucklers, such as Captain Blood (1935). sword-and-sandal epic a term for a movie, usually a Roman or Biblical epic, characterized by the weapons (swords) and footwear (sandals) of the period Examples: the many Victor Mature films, such as Samson and Delilah (1948), The Robe (1953), and Demetrius and the Gladiators (1954). Example: Conan the Barbarian (1982).